Candle for indoors with essential oil of Java Citronella, high-quality paraffin, natural fibre wick without lead or nylon. Duration over 24 hours. Notes: Made in Italy. Selected raw material of the highest quality. 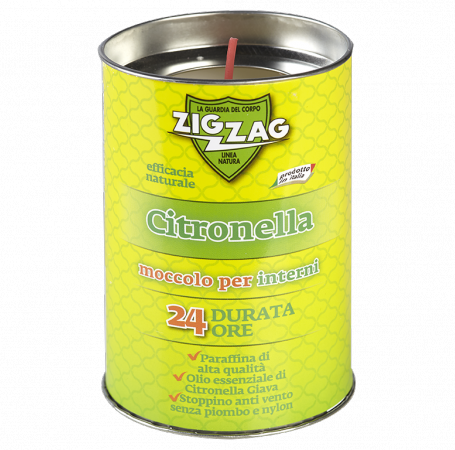 A high quantity of essential Citronella oil. Long-lasting (over 24 hours). An excellent quality-price ratio. Respect the environment: Natural effectiveness. Wick based on natural fibre without lead and nylon. This product is also available in "citronella and geranium" and "citronella and neem oil". Place the candle on a horizontal heatproof surface, away from flammable and combustible materials. Light the wick with a match or cigarette lighter and leave to burn. A pleasant and intense Citronella perfume will spread through the room. Keep out of the reach of children. Do not use in closed environments. Indoors and in semi-open spaces. On non-heatproof surfaces, near flammable and combustible materials. The product acts by respiration.